This past June my wife, Anne, and I went on a Leopard safari with Mokore Safaris. This was a perfect adventure. Things started when a couple of giraffes moved off of the cleared runway allowing the small plane to land and deliver us to our PH Neil and his trackers. What a way to start! After settling in to our lodging and meeting the camp staff the hunting activity began in earnest. In spite of extensive reading about leopard hunting, I did not appreciate how difficult and arduous a task it was. After ten days of checking for sign, shooting and hanging bait, building and sleeping in blinds the effort was rewarded. A fantastic leopard was shot! And, best of all, this wonderful adventure continued. 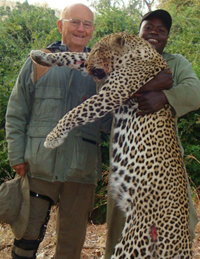 In addition to the leopard both Anne and I were able to collect other fantastic trophy animals. In the process we were given the opportunity to observe many different species, such as elephants, buffalo, giraffes, zebra, eland and kudu in their natural state. We also learned much about the threat poaching is to the native wildlife and hunting. we were also able to observe the activity conducted by Mokore Safaris to control and minimize the poaching threat. The camp is situated in an area with fantastic wildlife viewing; many hours each day were spent doing this. The accommodations were luxurious, the meals superb and all members of the camp and hunting staff responsive to our needs. Although I had hunted in southern Africa on four previous occasions, this was my first safari with Mokore Safaris; it was the best. This is the one that has given me the best appreciation of what an original African safari must have been. Anne and I hope to be able to repeat this experience. This letter is to anyone considering an African hunt .I have hunted with Mokore on three separte occations both in Zimbabwe and Mozambique primarly for cape buffalo but also for plains game. All three hunts were conducted with the highest level of professionism. The Duckworth Family have been doing this for a long time and it shows .They all pull together and if there is a problem with travel plans or visas for example they All band together and make the problem go away .On my last hunt this past September i took a 42 inch Buffalo and a 15 foot 6 inch croc in Mozambique, it was simply an amazing hunt. If you hunt with Mokore you will be hunting true professionals who are dedicated to providing you with a great hunt..
We just finished up our 6th Safaris with the Duckworth's. Great food, great friends, plentiful game always makes for a memorable trip and always leaves you wanting more. Neil and Gary are a class act and give you a true African Experience, we are looking forward to many more trips with Duckworth's. I have hunted with the Mokore Boys more times than I can remember!! They have outstanding camps in both Moz and Zim. Trophy quality is great as well as staff. Of course this would not be possible without their wives running the show!! 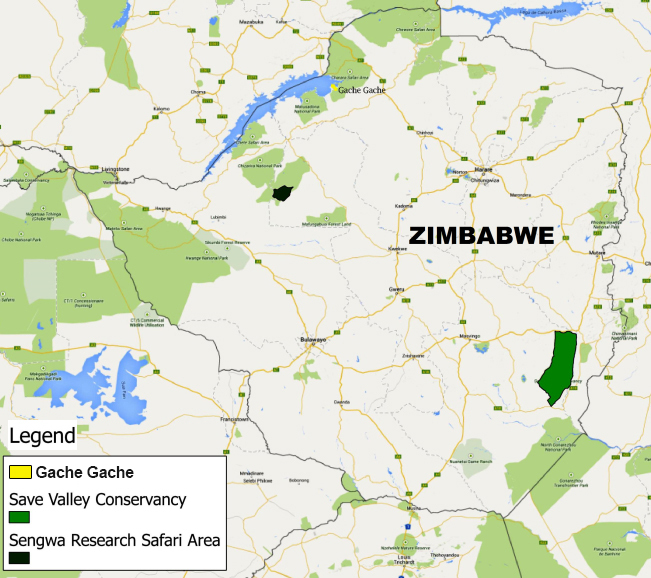 I've had the pleasure to hunt the Nhacainga Conservancy in Mozambique in 2011 and the Sengwa Research area in Zimbabwe in 2013 with the Duckworths. There are three things I really enjoy while hunting with them. One, you will hunt in game rich areas. Two, you're treated like family. Three, these guys really know how to hunt. That's a very potent combination for me to enjoy my African adventures. I have been able to harvest trophies with my bow and rifle that I am justifiably proud of and I had a great time doing it hunting with the best hunters I've ever been around in over 40 years of hunting. Did I mention that the camps are great too? I give Mokore Safaris very high marks in all aspects for a great African adventure. I would gladly hunt with them again. I went on an elephant hunt with Mokore Safaris in May and what a hunt. 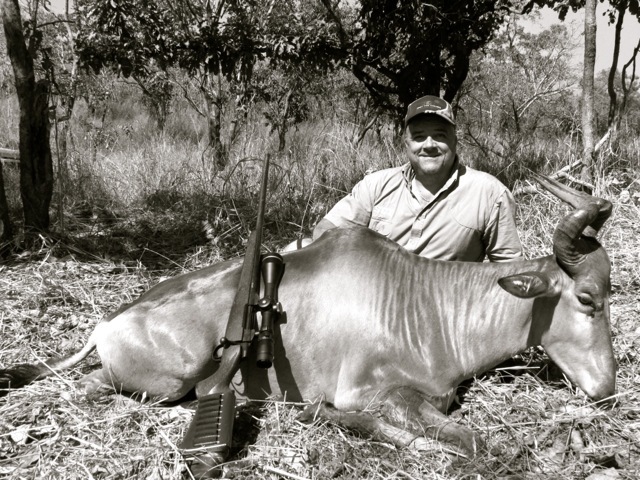 I hunted with Gary in the Save Valley in Zimbabwe. 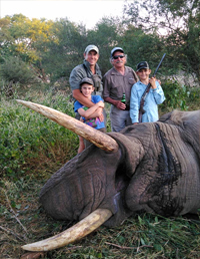 The thrill of the elephant hunt will be with me along time, but iI think we had even more fun once the elephant was down (a nice bull with 50" and 52" tusks). The Duckworth family is great to hang out with even when you are not hunting. By the end of the hunt, we were practically family. I would recommend them to anyone look for a dangerous or plainsgame hunt. It has been my pleasure to hunt with Gary and Neil Duckworth for at least 5 times. The Duckworths are very knowledgeable and capable outfitters. They know their territories, their game, and their staff are well trained. 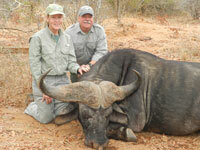 If you are considering an African safari, please check with Gary and Neil. I know you will not be disappointed. 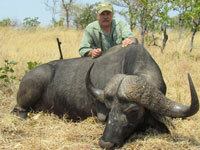 We have hunted with Mokore Safaris and Gary Duckworth on two occasions. Out of our seven safaris in Africa, these two were the best. The whole group was hardworking, professional and experienced. The trackers, cooks and the rest of the camp staff were amazing. Our next trip will also be with Mokore. I have known the Duckworth family for 12 years and have found them to be scrupulously honest in all of my dealings with them. If Gary tells you something you can believe it to be the truth as he knows it. This is no small thing in the world today where many people will tell you whatever they think you want to hear. When you are dealing with the sums of money it takes to go on safari today it is very important to know your PH is dealing in utmost good faith with you. This attitude carries through to all aspects of the hunt, the professionalism they exhibit is of the highest order. I have never had Gary suggest I shoot an animal just to fulfill my request for the species in question, if it is not a respectable animal he will let it pass. You will never be embarrassed showing your trophies to anyone, regardless of their experience with African game. The trophy preparation though seldom spoken of is very important for the finished product (The mount) to come out looking the way you want it. I’m no expert in trophy prep but my good friend the taxidermist is and he has repeatedly commented on the quality of the skins that come from Mokore. Based on that I have to conclude they are doing a first rate job in that area as well. I have some experience hunting dangerous game and again the professionalism of Gary is first rate. It is extremely important that your PH be very knowledgeable when in pursuit of elephant and buffalo. Gary displays all of the traits one would wish to see in a PH while hunting dangerous game. If you are contemplating an African safari I can recommend without reservation Mokore Safaris. I have hunted with Gary in Zimbabwe and Mozambique on numerous occasions and anticipate another hunt in 2015 .If you wish to call me, contact details are detailed below. When we think back upon our days that just seemed to fly by…our minds view images of our comfortable chalet when we were awakened by the lions in the early morning darkness. We can still see the fire pit ablaze in the dim light…and actually smell the wood smoke as it provided heat after the short walk to the dining area. We still see the shadows as your staff moved silently in the darkness preparing for each of us, with their smiles the needed things that always came together to provide our comfort. I am not sure if I could point out the Southern Cross, but the way the stars lit up the black night sky as I looked up past the the vine covered trees, was truly amazing. As you can see…we have not even left camp! We remember cold morning drives when the air bit into us and then shortly after, the light from the morning sun blast through the trees and and past koppies…to reveal the red and orange colored light…replacing the chill with heat. I remember the cow buffalo that got so close to you as I watched in safety behind a small forked tree. It would have been so easy for her to hook you with her sharp horn and take away the excitement we are feeling by being on the path they were following. I remember the bat that swooped down over our dinner table at night, while we cheered the days events and toasted each other on another fine day. Wine glasses clanking as smiles expressed the joy as tasty dishes of game meat and delicacies were laid before us. The time Susan and I had with you is without a doubt the best time we have ever experienced…and sharing our time with each of the Duckworth family members made us feel like a part of your family! I hunted with Mokore Safaris in August, 2018 at their Coutada 9 Camp in Mozambique. This was a focused 10 day hunt guided by Doug Duckworth. I was particularly interested in a sable, kudu, and bush buck and collected nice trophies of all three. I was also interested in a nyala, but I totally messed up a good opportunity on that. Sable, bush buck and nyala were common. 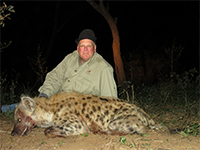 Kudu and wart hog were very abundant, the trophy quality was good to high on all species. Lion, buffalo, and elephant were not on my list, but all are present. The area I hunted was vast and varied. I did not see any other hunters. Our professional hunter, Doug Duckworth, had guided me on a photo safari several years earlier in this same area. Game numbers appear to have increased markedly. I consider the guiding, game spotting, and tracking to be of the highest quality. Doug also entertained my non-hunting, photographer wife very nicely for 10 days. Accommodations are comfortable, but not luxurious. Food ranged from unvarying oatmeal for breakfast to delicious, largely game-meat lunches and dinners. The staff was most accommodating. 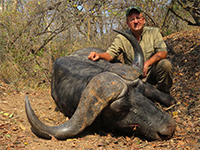 This past July we completed our 5th hunt with Mokore Safaris. On our last safari, my wife took a beautiful tom leopard and a bull giraffe while I hunted predators. 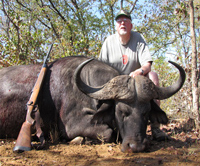 In the past Gary has successfully guided us to buffalo, a tuskless elephant and nearly 5 dozen other trophies. All of the camps are 1st rate with superb accommodations and meticulously trained staffs. The trackers are worth the daily rate just to watch. I truly believe they are some of the best in the world. The meals rival any 4-star hotel on the planet. Our taxidermist is constantly amazed at the quality trophies that Gary produces and the field care they receive under his eye after the hunt. 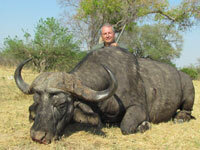 We’ve hunted with many other outfitters in Africa, Europe, and the America’s. None exceed Gary’s professionalism, commitment to conservation and dedication to an overall superb experience. The highest compliment you can pay a host is to say you don’t want to leave—we always want to stay for more. Gary and Neil and their families are now part of our family. Live your dreams and book with Gary or Neil today. If you want to learn more don’t hesitate to call. My brother caught the Africa “bug” long before I did and spent two or three years researching on the web, at shows, and talking to outfitters and several PHs. I was a little more than nervous, when out of the blue, I got a call to start making a list of everything you’ll need, we’re booked to hunt in Zim 6 months. I knew he had done his homework, but still, this is a major call on what I thought would be a once in a lifetime trip for me. From that point on everything I learned about Mokore Safaris told me he had made the right decision. Our booking agent, Mark Young, in general terms told us don’t worry, you're in good hands, he doesn’t hear from clients while they’re at Mokore, and you will enjoy it. He was right! In Sept. of 2016 we got our first taste of Africa at the Mokore Ranch. We arrived at the border of Savé Valley Conservancy after dark and the wildlife encountered on the drive into camp already had us spinning. Once in camp, we met everyone during the evening meal and all but my brother and I turned in. Within three hours in camp, while setting by the fire, we heard our first lions. Now I have the “bug” and are already wondering how I am going to make it back. The Savé is a special place. I had on the ground encounters with lions, elephants, rhinos, crocks, hippos, wild dogs, and cheetahs. Could have taken the hunt out of the trip and I would have gone home happy. 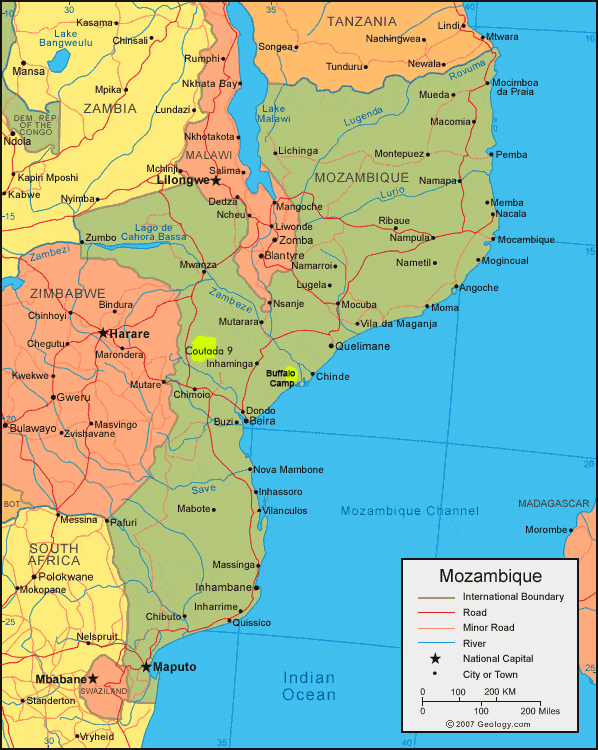 Two long years later, we made it back to Mozambique in Sept 2018. I was planning on a bit of a let-down after the bar had been set so high in Zim. I was wrong. The place is amazing. The Duckworth family has made a huge commitment to restore Coutada 9 that very few people or even Countries would make. A prime example of wildlife conservation at the highest level. I was humbled to have been a part of it and they should be very proud of what they are accomplishing in a huge uphill battle. For an area that had been poached into extinction, 15 years of work, reintroduction, and protection has turn it into a plains game paradise with a bright future. I hope they are allowed to win. The hunting was unreal! Someone interacted with elephants or lions every day. Had a lioness walk around the kitchen the first night in camp. Witnessed the release of 60 Cape Buffalo that Mokore got the ticket for capture, transport, care, and release. Pretty cool. I’ve had the pleasure of hunting with Gary, Neil, and Doug. Even spent a day fishing with Barrie. You cannot go wrong with any of them. All class acts, professionals that put you harvesting a quality animal over checking something off a list. Things are done right. The deck overlooking the Turgwe River at Mokore is worth the trip. The camps and staff make everything every comfortable for your stay. The food is great and the wild game for meals cannot be beat. The BS sessions around the evening fire become an important part of the trip. You really look forward to time with new friends and sharing the days events. A once in a lifetime hunt cannot go wrong! If it’s your first or just your next hunt, it’s too important to not do it right. The Duckworths do it right. If you go once, you’ll be back for more. I’m already thinking Sengwa for 2020. 2019 will be my fourth trip hunting with the Mokore team and I can only say that each year they somehow manage to eclipse the previous one ! The entire operation is exceptionally well run with nothing ever being too much to ask - both Neil and Gary are consummate professionals with a great knowledge and love for the African bush. It is a true privilege to safari with the Mokore Team and could only suggest one tries them as you will certainly not be disappointed !